Down at The Outpost under new General Manager Kuiama St. Gelais’ watch, the guides were putting our guests on them early and often. Three Rocks less than five minutes away from the lodge was the place to be as guests were into double headers all day, with each boat getting into 40+ Chinooks, and a few tyees along the way. 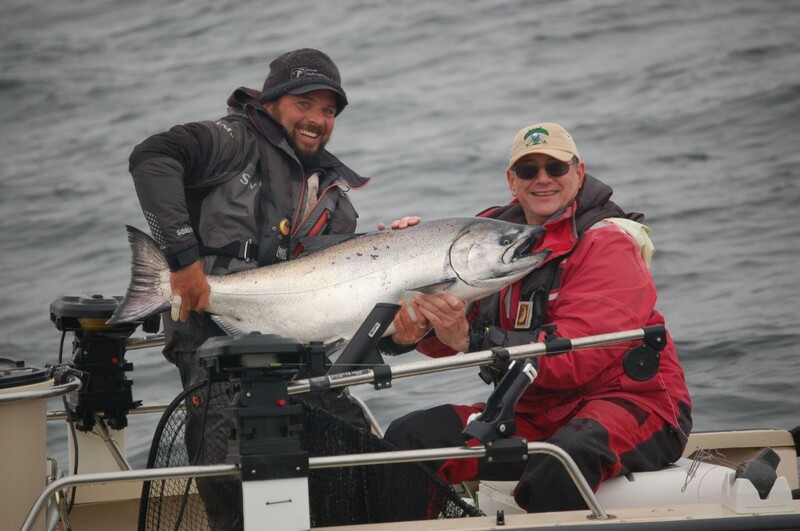 As June continued, the size of the Chinooks got better every day as there were more and more in the high teens and into the mid to high twenties along with several tyees each trip. 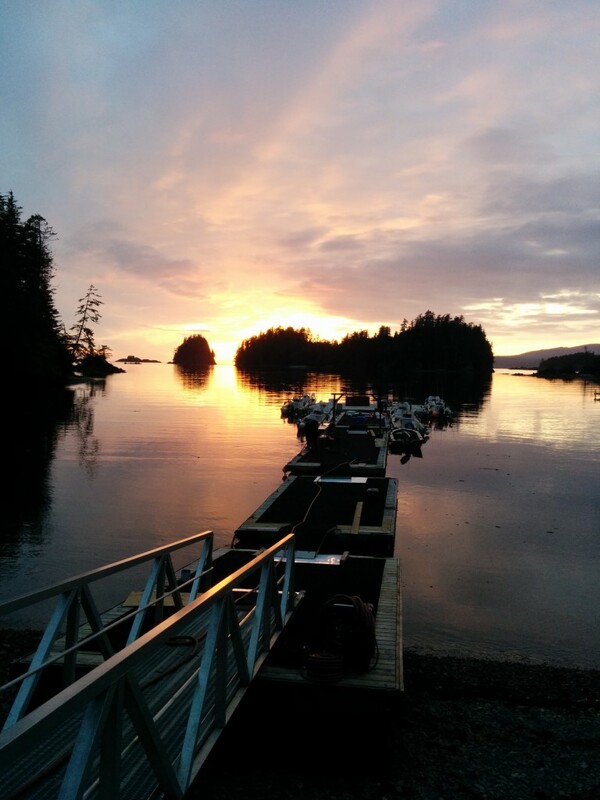 As the end of June approached signs that the fish had started to move south resulted in the guides going down to legendary spots like Hippa Island and Freeman rock. This produced the results that one would wish for with lots of action packed days. * Beautiful Port Louis sunset. 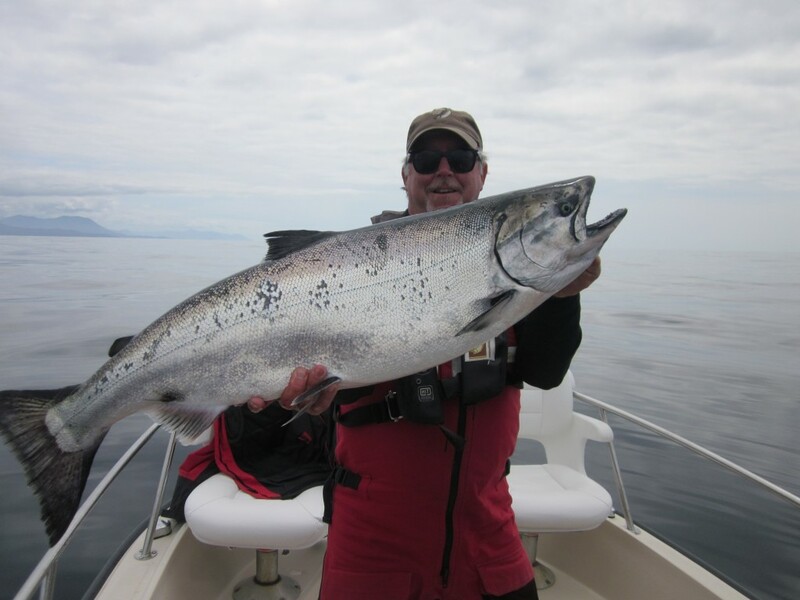 * Randy Hansen with a tyee caught at Freeman Rocks on a glass calm day. * Early season fishing at Three Rocks on a gorgeous calm morning. 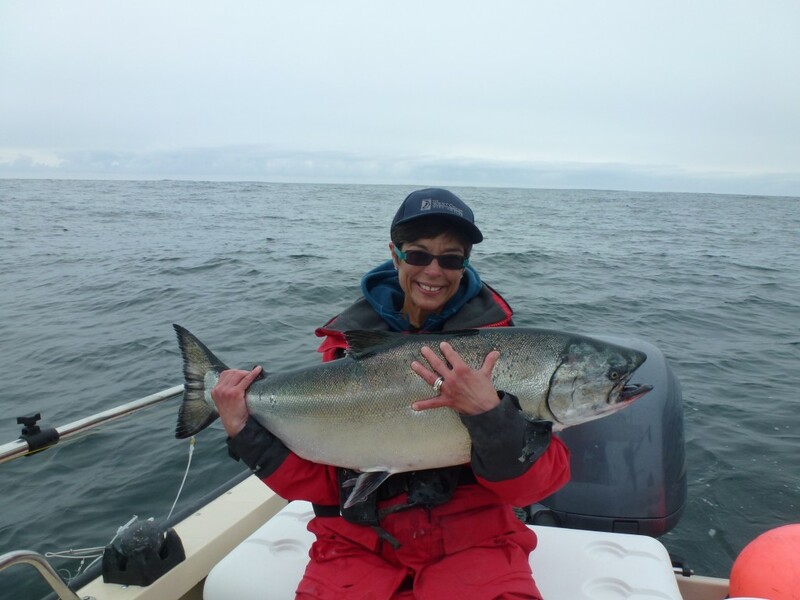 * 30lb tyee for Liz Mullins. July brought with it a huge biomass of herring that flanked the west side from hot spots like Selvenson right down to legendary Freeman Rock. 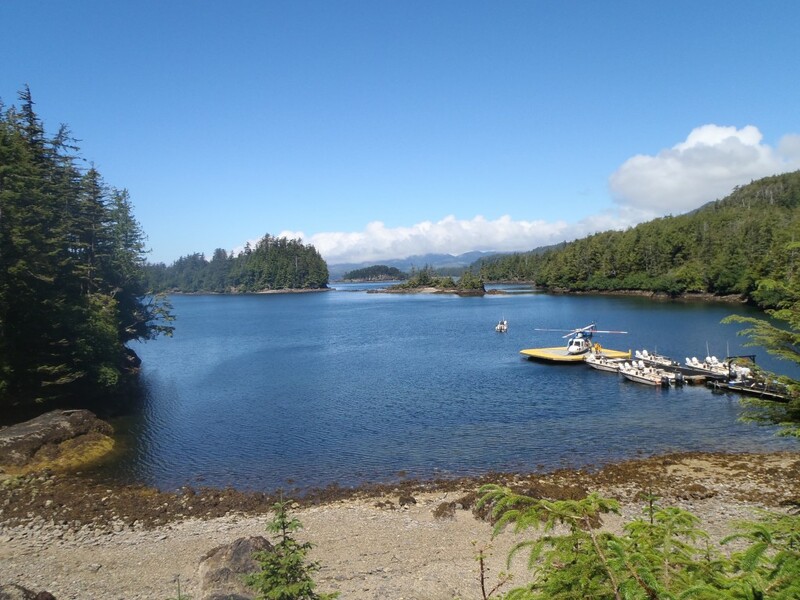 Freeman rock might be the best kept secret in Haida Gwaii where herring balls the size of city blocks, thousands of Chinook Salmon, sharkes, eagles, whales and some lucky angers meet up for an experience unlike any other. 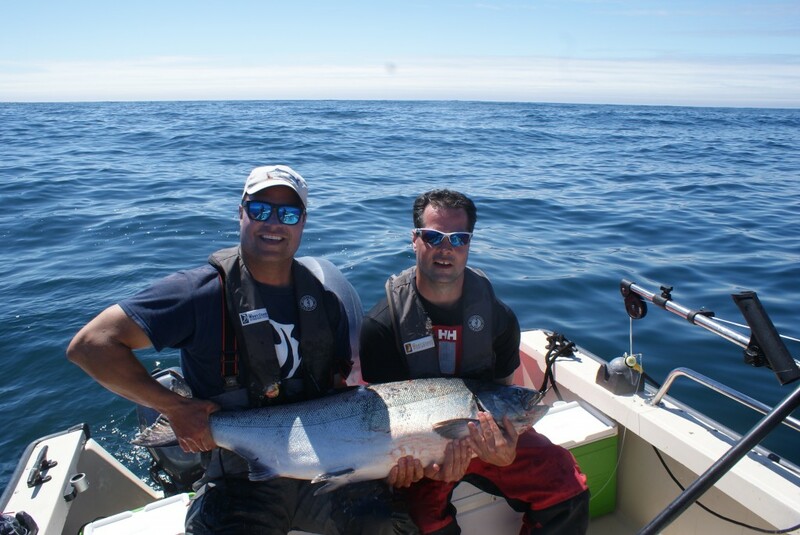 Almost every trip in July experienced at least 1 to 2 ridiculous sessions of 20 to 30 Chinook per boat a day. 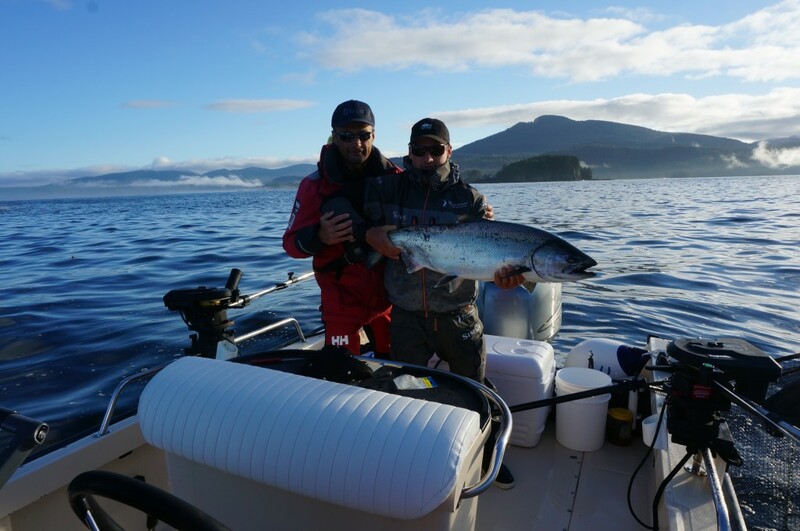 As July went on the average size of the Chinooks increased, the Halibut fishing as usual was better than anywhere on the coast, and the weather was terrific. As July progressed the average size for Chinooks was twenty with decent numbers of mid to high twenties around with some tyees caught and lost along the way. * Guests touch down on a beautiful sunny day in Port Louis. 44.6lb Hippa Hog for Allan Smolinski and veteran guide Sam Harrison. 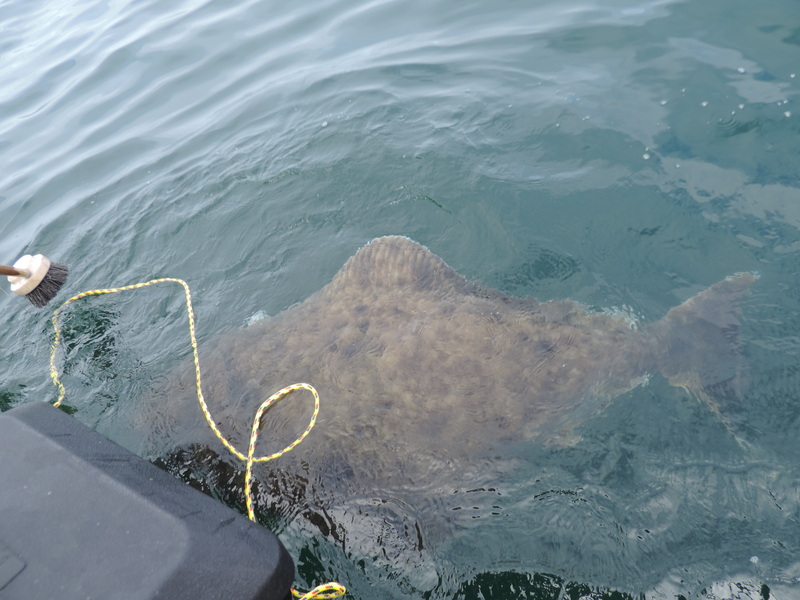 * 285 lb Halibut that taped out to 6′ 7″. * Chad Holonics with guide Carl Archibald and a 43 lb Freeman Hog. Outside of the consistent Chinook fishing that we experienced all summer long at The Outpost, between the end of July and August 10th our guests caught and released over a dozen Halibut over 100 pounds, including 4 over 235 pounds and one behemoth estimated at 335 pounds, which measured over 85 inches. 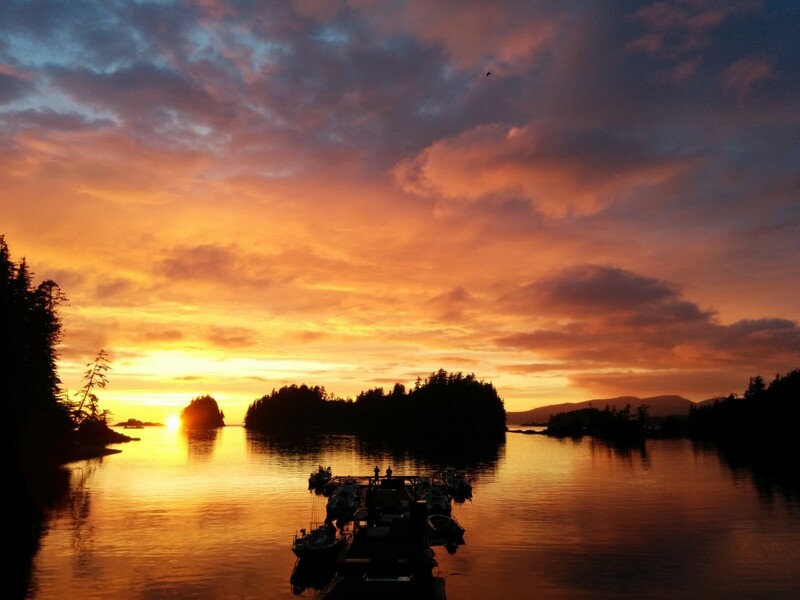 If the busy Chinook Salmon action, abundant Cohos, and world’s best Halibut fishing wasn’t enough. 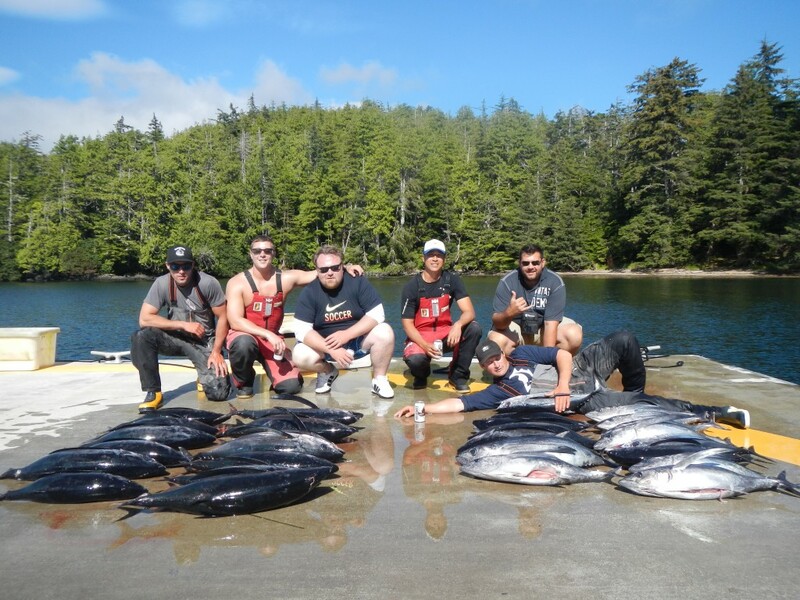 August is always the time of year at The Outpost when rumors of a Tuna trip start to come up and this year, much like 2011 during the first inaugural Tuna trip from The Outpost, was a great success. This year 4 boats went out on this excursion and by mid day the boys could’t fit any more Tuna in their coolers if they tried and brought over 50 Tuna back to the dock. What a special experience that was. * Doesn’t get any better than this. 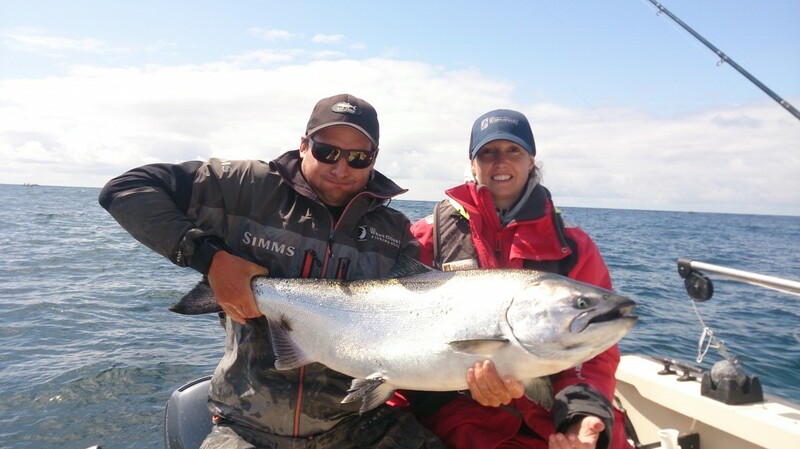 * Jacquie Humphries and guide Myles Panz with a nice tyee. * Luke, Joey, Jason and Johnny with guides Myles and Dewey showing off their haul. 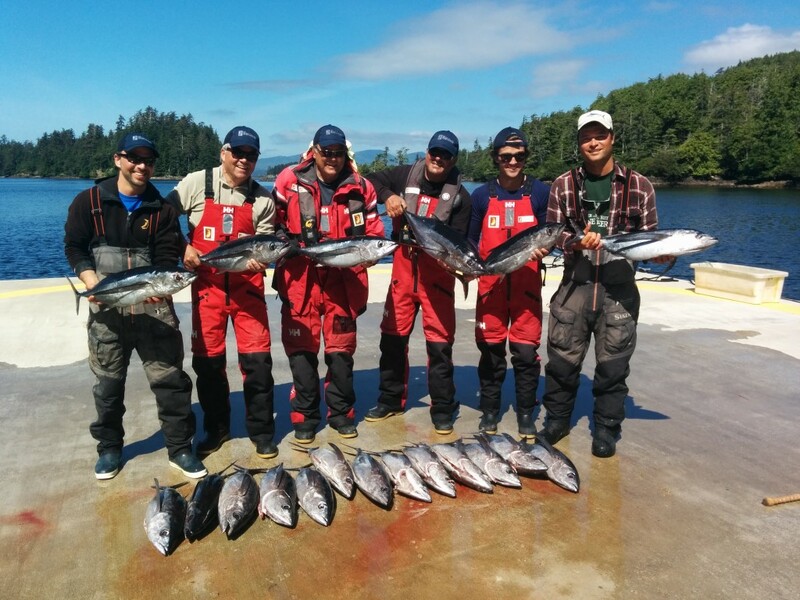 * Guide Sam Harrison, Bluewater Bernard, Riptide Rob, Deepwater Don, J-Hook Josh and Guide Carl Archibald pose for a group pic at the end of a perfect day in Haida Gwaii. If you missed out on the 2014 season, be sure to pick up the phone and CALL US TODAY at 1-888-432-6666 to secure your spots for next season before it’s too late. You can also click here to fill out an inquiry online.